Fans were finally treated to a new episode of HBO’s Game of Thrones after a 20 month wait with the eighth and final season premiere on April 14, 2019. The world of warring houses, dragons, and White Walkers welcomed viewers back with an episode that broke previous Game of Thrones viewership records. According to HBO, season eight episode one (“Winterfell”) was watched by 17.4 million viewers. That number’s up half a million over the previous record which was set with the season seven finale. 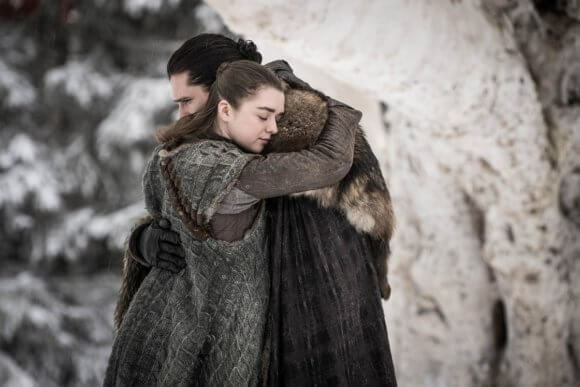 Plus, “Winterfell” topped the season seven premiere by over a million viewers. “Winterfell” also set a record as the most Tweeted episode of Game of Thrones. Game of Thrones drove up the viewership numbers for HBO’s other Sunday night programs. Barry drew in a record number of viewers to the comedy series, quadrupling last week’s numbers according to HBO. Veep starring Julia Louis-Dreyfus had its biggest night numbers-wise since June 2016 (season five). And Last Week Tonight with John Oliver drew in more viewers for its April 15th episode than any episode since August 2017. The cast of Game of Thrones season eight includes Kit Harington as Jon Snow, Emilia Clarke as Daenerys Targaryen, Sophie Turner as Sansa Stark, Maisie Williams as Arya Stark, Peter Dinklage as Tyrion Lannister, Lena Headey as Cersei Lannister, and Nikolaj Coster-Waldau as Jaime Lannister. Iain Glen is Jorah Mormont, John Bradley is Samwell Tarly, Gwendoline Christie is Brienne, and Isaac Hempstead Wright plays Bran Stark.